Improved accessibility/ connectivity with both the Urban Extension and the Rural Areas. The National Capital Territory of Delhi boundary on it’s southern and western sides. Approximately 46 villages fall in this zone (Refer Annexure I). Najafgarh is one of the major urban agglomerations. Other settlements like Tikri Kalan, Dhansa, Jharoda Kalan, Jasfarpur Kalan etc are major rural settlements. Covers a large land bank adjoining to Dwarka Subcity in West Delhi. It is also one of the priority areas for residential development. The Area all together is connected to Dwarka, International Airport, Residential and Industrial Area of Gurgaon, Manesar and Dwarka Expressway and two proposed highway corridors passing through the zone. Planned diplomatic enclave in Dwarka attracting VVIP security and excellent ambiance. Close proximity to the forthcoming 186 acres 18 hole golf course (upcoming). The Najafgarh Jheel demarcates Delhi from Gurugram on this part. The area falling between the four landmarks, namely, the stretch of Jheel on one side, Dwarka on another, NH-10 (Rohtak Highway) on another, and Jhajjar (Haryana) on another. The villages on the periphery of Delhi would be retained as green belts, acting as the lungs of Delhi. The planned second diplomatic enclave in Dwarka attracting VVIP security and its excellent ambiance. The forthcoming Kundli-Manesar-Palwal Expressway, among others. The area is also in close proximity to South Delhi. This is about 5 to 10% of the total area available in Delhi for urbanization. New farm houses shall be only allowed in the green belt zone. 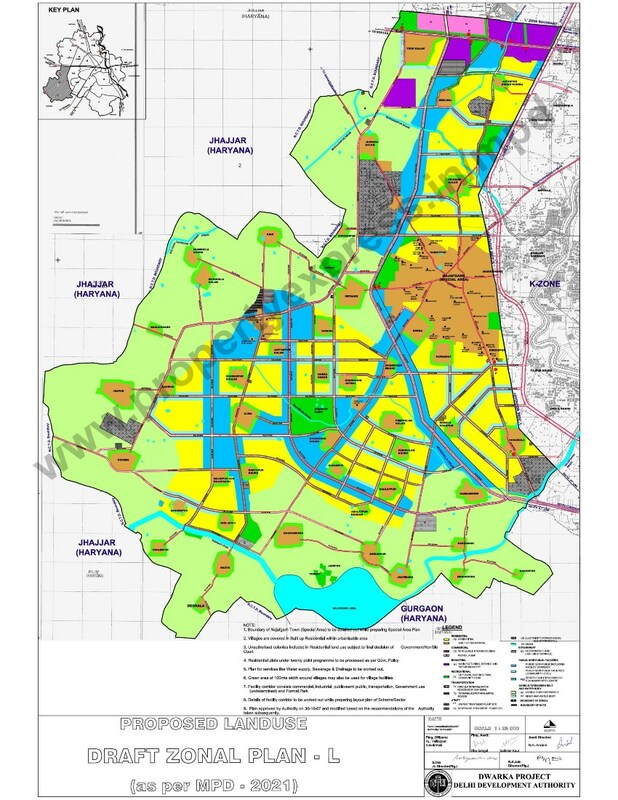 The Dwarka Phase 2 ( L zone ) consists of 21 peripheral villages abutting Haryana. The city is yet to spend/develop the infrastructure in these zones. 900 acres in Dwarka Phase 2 ( Zone L) have been earmarked for a water reservoir by the Delhi government. The Delhi government thinking is to have this zone act as the lungs of Delhi. Farm houses in South Delhi are expensively priced between pays 15 to 20 crores per acre. Investors in Delhi are excited that they have an opportunity to invest in a farmhouse at reasonable prices that exist in L and R zones. Greenbelt near Gurugram sectors have already seen 100% appreciation. Still, even today it is a good investment option as with passage of time, prices will continue to march northwards.